Johnny Depp, Amber Heard, and Comic-Con: The Best Performance Belonged to Warner Bros. The exes were part of the same line-up this weekend, promoting their projects "Fantastic Beasts: The Crimes of Grindelwald" and "Aquaman." 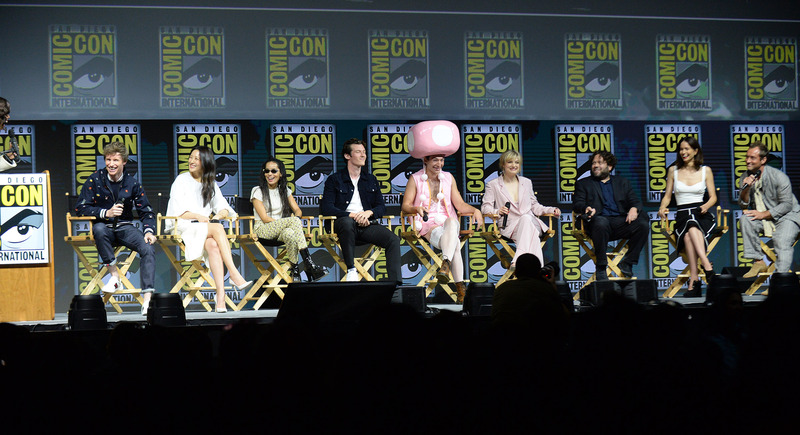 While Comic-Con doesn’t offer a competition, Warner Bros. took the prize for the event’s most awkward moment with its Saturday-morning Hall H presentation, bookended by ex-spouses Johnny Depp and Amber Heard. Her film, “Aquaman,” concluded the two-hour spectacle, but Depp’s surprise appearance in character as Gellert Grindelwald, villain of “Fantastic Beasts: The Crimes of Grindelwald,” dominated the proceedings with a rapturous fan response and a stage-managed presence worthy of its own ovation. On the surface, it would seem a bad time to be Johnny Depp. He’s made all the wrong headlines — the just-settled fraud lawsuit he filed against his business managers and lawyers, another lawsuit where he is accused of punching a location manager on his upcoming “City of Lies,” a deeply unflattering Rolling Stone profile “The Trouble with Johnny Depp,” cadaverous photos, and, of course, the rancorous divorce that included Heard filing a restraining order citing verbal and physical abuse, with text messages, photographs, and witnesses to back her allegations. Grindelwald made a cameo appearance in Eddie Redmayne-led “Fantastic Beasts and Where to Find Them,” which was released shortly after Heard filed for divorce. With “Grindelwald,” Depp’s role is larger; David Yates and J.K. Rowling, the respective director and writer/producer of the “Fantastic Beasts” movies, have each defended his casting. Still, evidence suggested that Warner Bros. wasn’t altogether confident in its decision. Despite being the title character, Depp was at the edge of the first released cast photograph. The three-time Oscar nominee was also not part of the studio’s April CinemaCon presentation, where six of his fellow actors unveiled footage for the National Association of Theatre Owners. So, Depp was expected to be a Comic-Con no-show. But late into a Q&A with nine of his plainclothes co-stars, moderator Aisha Tyler mentioned Grindelwald. Thuds and an explosive sound shook the theater, now dark except for the glowing bracelets each attendee received upon entry. Then there was a clip of Depp — followed by the man himself, to the delight of 6,500 fans in the San Diego Convention Center, who provided the most rowdy reception of the entire event. However, it wasn’t really Depp; it was Grindelwald, who delivered a two-minute speech — “I say the Muggles are not lesser, but other” — and never interacted with his castmates before he vanished with a detonating burst. It was an extraordinary performance: Warner Bros. successfully capitalized on the star’s enduring popularity, with no exposure to uncomfortable questions. Technically, the entire presentation was meant to build up to “Aquaman,” the next DC tentpole. Writer-director James Wan, Jason Momoa, Heard, and co-stars Patrick Wilson, Nicole Kidman, and Yahya Abdul-Mateen II spent more time onstage than any other group, debuting the trailer as well as additional footage. This Article is related to: Film and tagged Amber Heard, Johnny Depp, Warner Bros.